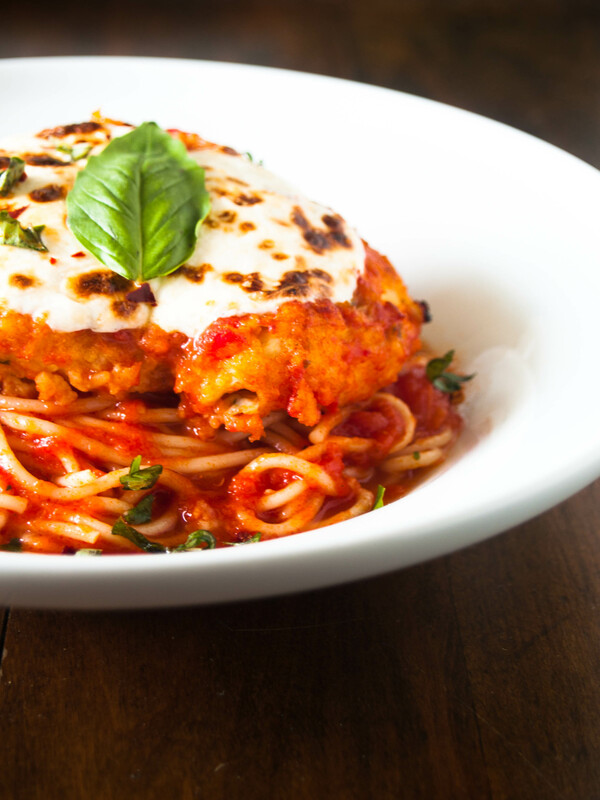 Chicken Parmesan holds a special place in the hearts of our family. This dish is on the menu for any special occasion: Valentine’s Day, birthdays, Mother’s Day. There is a lot of love that goes into this meal. Not only is it made in our home, but we also had a special place in Texas where we would all order this dish, Mary’s. Now, understand that the name of the restaurant was La Bistro Italiano, but the piano player was named Mary. Therefore, our family renamed the restaurant Mary’s. Every Friday and Saturday night, Mary would be there in the corner, tickling the ivories. We would sit there, bobbing our heads (as if that was a substitution for dancing) with smiles on our faces while trying to eat up the Chicken Parmesan as fast as humanly possible. It once served as amuse-bouches as Mary and one of the regulars got into a fight one night. Mary, of course, got the last word, and we held up our chicken and waved it around in her honor. In a large saucepan, heat olive oil of medium heat. Add the garlic and red pepper flakes for 30 seconds. Add the tomatoes and cook until the mixture begins to come to a boil. Reduce heat to low and add basil. Season with salt, pepper and add chicken stock. Let sauce cook for at least 45 minutes. Place chicken in a heavy-duty freezer bag, one piece at a time. With a meat hammer, pound the chicken until about ¼ inch to ½ inch thick. Set up breading station with the flour and cayenne in one dish, eggs and milk in another, and the panko, parsley and parmesan in the last. Season all of the dishes with salt and pepper. Dredge the chicken in the flour, then the eggs and finally the panko. Let the breaded chicken rest on a wire rack over a cookie sheet. Set a skillet over medium high heat. Coat the bottom of the skillet with a few tablespoons of canola oil. Once the oil starts to smoke, place the chicken in the skillet and sauté until browned on both sides. In a 12×9-baking dish, place 1 cup of the sauce on the bottom of the dish. Place the browned chicken in the baking dish. Top the chicken with more sauce. Place dish into a 375o oven for 25-30 minutes or until the chicken is cooked through all of the way. Serve with angel hair pasta and garnish with parsley. Had it last night and loved it! “Mary’s” is my favorite place on earth, I would sit there for days and eat the bread and drink their fresh water and eat that delectable chicken parmesan! Which you recreated beautifully! Ever since Amber made chicken parmesian for my birthday, I have been eating all that was left. Luckily, Amber made a lot! I’m lucky for the next day or so cause when I get home I eat chicken parmesian for a snack 🙂 It’s probably all gone already 🙁 Oh well… Mother’s day better come fast!!!! Thanks for letting me know! It is all fixed now! the cook I want to be for my family. Oh I’m so happy you’re family loved the recipe! That makes my heart so full. I love sharing these moments in the kitchen with y’all! Happy cooking!